This week I’m responding to the Weekly Challenge with a bit of grunge, beginning with my opening capture. 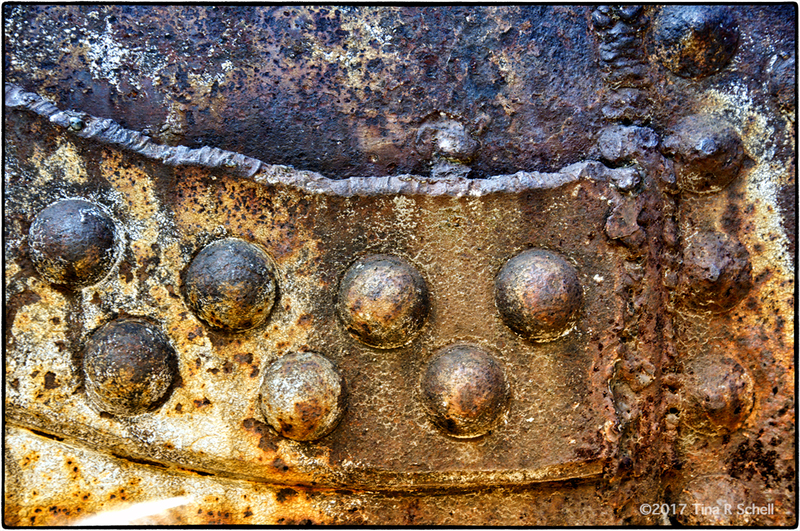 I created the image by applying some Photoshop color tones to the rusty metal which was part of an old canoe. 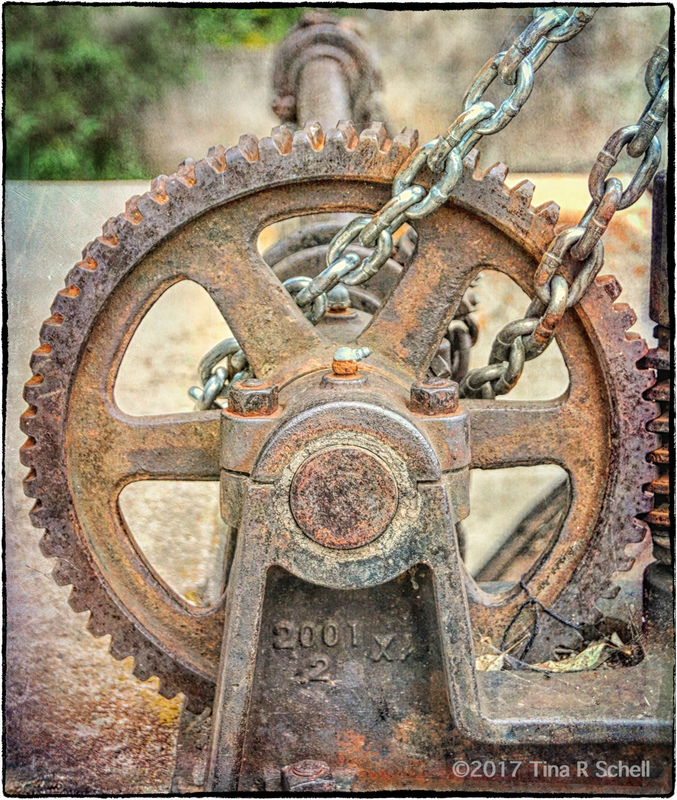 Similarly, I applied some grunge textures to the corroded wheel below, which I discovered on one of my many hikes. It was the control valve for a small waterfall that had obviously been locked in place to prevent tampering. While out walking with a good friend one afternoon, I came upon a frightening example of bad plumbing sitting at the base of a building on a busy street. I’m sure most of the passersby (and my friend) found it a bit bizarre as I knelt to photograph it, but I thought it might one day be blog-worthy 😊. ( One of my favorite things about blogging is how often it makes me think and shoot “outside the box”.) For the version that follows I used both a texture overlay and some Photoshop color mapping to create the final image. Unlike my first three images, the circle below is a capture of one of my favorite pieces of art. 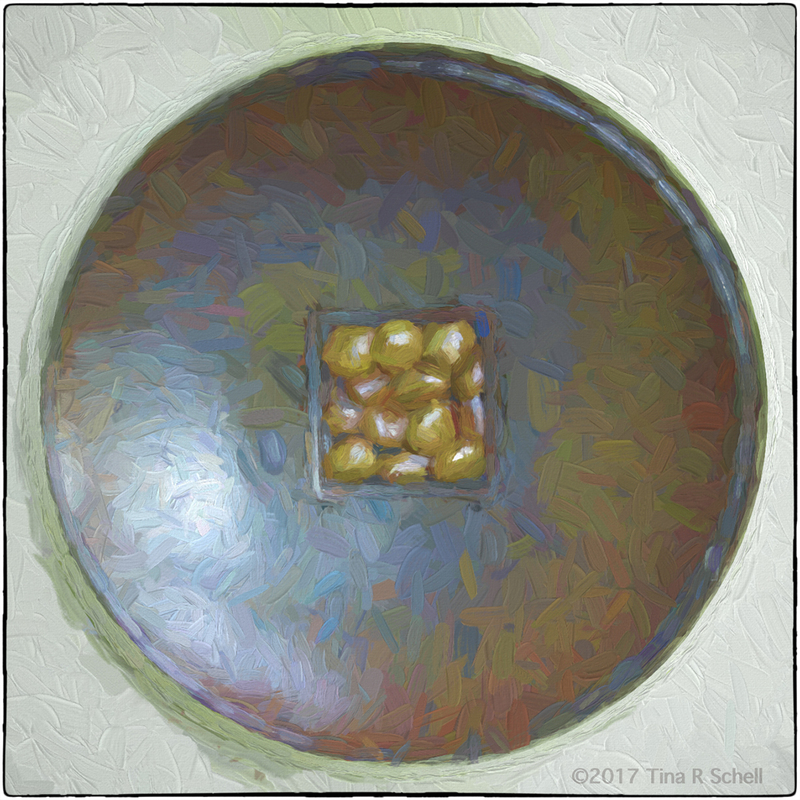 It’s a very heavy, ceramic orb with a square of round rocks in its center and hangs on the wall of my home. It also represents a fond memory of a day spent with good friends at an art show in California. I applied an impressionist filter from Topaz to my original capture for a more artistic feel. Here’s to our beautiful round earth and all of its wonders wherever you find them. I like what you did with the photos, especially the plumbing. You made the mundane look like an art piece. These are a lot of fun, Tina, especially the Bad Plumbing one. I think it’s hard to know when to stop with the effects, and you struck a perfect balance – the colors are beautiful, too. Many thanks Lynn – I do enjoy playing with the images sometimes but try not to get carried away!! Hi Tina. i fully support your remarks about our beautiful round Earth and my friend which I have not met Alexey Neonov. But it did inspire me to go and read up on the flat Earth society. Apparently Antarctica goes right around the earth :and “holds in the oceans”. Nasa and Google Earth is a conspiracy to promote space flight which did not happen. etc etc and it appears to be intelligent people writing this! Nice photos and playing (photoshopping and Topaz). And very soon I will broaden my mind, still be believe in a spherical earth but upgrade your playing to what it actually is: art. Abrie, you crack me up! I always think of how immensely brave it was for the early explorers to sail off into the sunset not knowing if they’d drop off the end of the earth! As for my playing – thank you for the lovely compliment. There are many levels of art, including 1st graders learning to fingerprint so I shall graciously accept your definition! Great subjects for the grunge treatment. Normally I am not a fan of the look, but it fits these subjects. 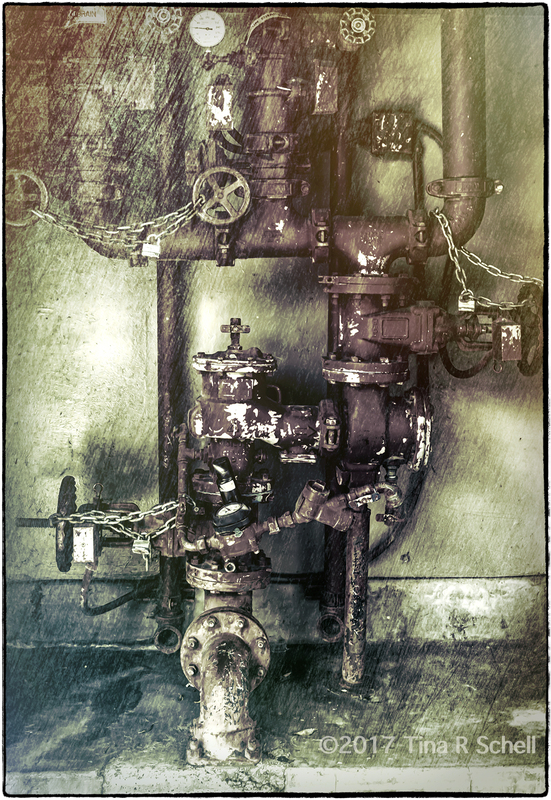 I like the chained plumbing shot best. Thanks very much John – several people have sent me interpretations of that one, noting the presence of the cross and perhaps a baptismal font. Although I didn’t see them when I shot the photo, I do now. Always interesting what the viewer brings to the party! As usual you find apt examples and quotes, always heartfelt. Thank you Sally – heartfelt is as welcome a compliment as one can ask for! Great gallery – much beauty and much fun! Thanks Leya – glad you enjoyed this one. Great photographs for the prompt, Tina! Thank you Miss Linda – as always your excellent eye has captured an important element! I really like Crusty! It looks like art to me. Many thanks MK – that’s about the most we can hope for! Thanks Nora – it was a fun week for me with this one! My pleasure Pauline. Welcome Back!!! Very nice response to the challenge. I like the work you have done on these photos they have texture that comes right off the page ( or the screen). A personal favorite John – glad I brought it to your mind! LOL, thanks Andy! Haven’t thought about tetanus since I was about 6 years old !! Love your creativity 🙃!! Such a joy to see your images! Joy is a wonderful compliment Trees, many thanks! You’ve rounded up quite a few excellent images today! Like most other commenters here, I loved the grunge look you’ve added to these orbs. Many thanks Lex – it was an interesting experiment! Interesting textures and colors. I especially liked the first one, maybe because if the complementary colors. Love the grunge look. These are the types of things I take photos of as well and I may have to experiment with a bit of similar editing, although I only have Picasa and some apps on my iPad. I started with Picasa many moons ago Janet – I think they’ve actually just announced that they’re stopping its development. I highly recommend Lightroom, which when combined with Topaz can create some amazing effects. Keep playing, you’ll find you can really experiment with some interesting options! As Dina said, it is always a delight to see what you come up with for the challenge. I love capturing odd things too, and you are dead right about seeing things differently for the blogging world! Love your textures, it’s nice to see them again and I was only thinking the other day that I haven’t used any textures or layering for ages. Funny how we go through phases. True Jude, we definitely find ourselves in phases, don’t we? This past week we had a presenter at our photography meeting who did an hour on abstract landscapes which I think put me in the mood for these. Who knows what next week will bring!! Thanks Dina – I do enjoy getting creative with the images sometimes – other times I enjoy them more straight Out Of Camera. Hope your weekend was wonderful too! Lovely collection of photos Tina! These rounded answers to the challenge, and especially that ceramic orb, are very good! Interesting textures and shapes, Tina. And, of course, the ceramic piece brings back good memories. A fine artist. Thanks Jane – enjoyed playing this week. Thanks Adrian – something a bit different this week – always good to try something new! Love your photos and your post editing explanations, Tina! I’m like you, I randomly take photos of things thinking they’ll be blog worthy, or good for instagram. Thanks Terri, it’s nice to have an outlet for the art we create, don’t you think? Love the ‘Crusty’, but I do like your ceramic item too…a nice set of rounded things, Tina! Thanks Sue, glad you enjoyed. Crusty was my favorite this week. Tina, the distressed metal theme with photoshop enhancement gives an interesting rustic look to rounded. Thanks Jane, had fun with this one!